Arriving at our home with a loaf of squishy Sara Lee, I knew it was time to transition my niece into home-baked bread. Not surprisingly, she loved it – everything from kneading the dough, to seeing it rise beyond the confines of the loaf pan, to slathering it with peanut butter fresh from the oven. Fortunately for me, she prefers whole grain flavor to nutrition-less white, so this honey wheat sandwich bread has become a weekly staple. 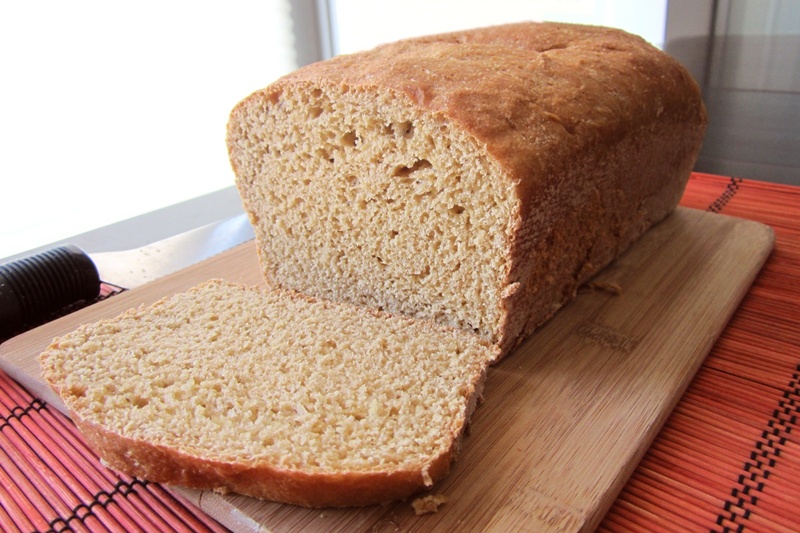 This honey wheat sandwich bread is definitely fun to make with kids of all ages. They can help mix and knead the dough (we do it all by hand – no mixer or bread maker required! ), shape it into a loaf, and be amazed as it rises. Since my niece is a teen, she’s even taken over baking this honey wheat sandwich bread by herself, from start to finish. 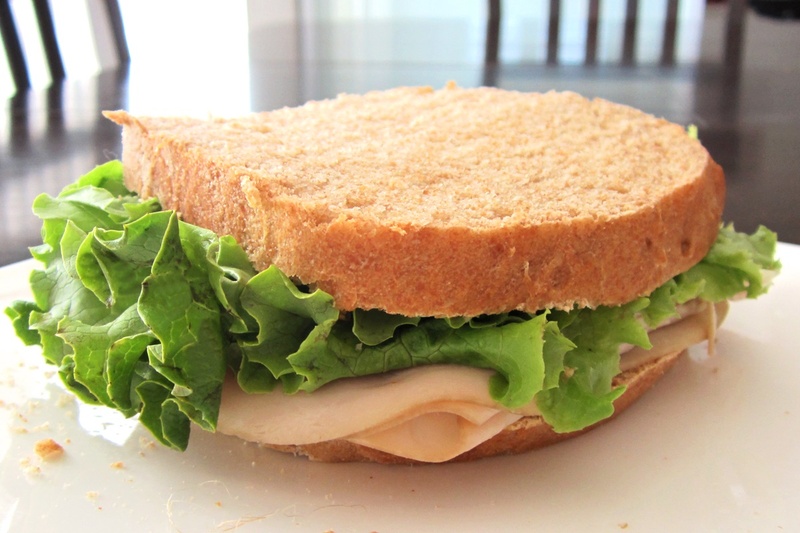 I get to enjoy slices of it slathered with nut butter, but for her, it’s all about making the best lunchtime sandwiches. By ingredients, this recipe is dairy-free / non-dairy, egg-free, optionally nut-free, peanut-free, soy-free, and vegetarian. For vegan wheat sandwich bread, forgo the “honey” part and use an equivalent amount of maple syrup or agave nectar in its place. Easy peasy and equally delicious! Please note that the prep time does not include the 90 minute rising time. Pour the milk alternative into a mixing bowl and add the yeast. Allow the yeast to “proof” for 5 minutes. It should foam a bit if still active. Stir in the oil, honey, salt, and wheat flour, until well combined. Gradually add the bread flour, and when it gets too difficult to stir, start kneading the dough with your hands. Knead until it is smooth and elastic.If the dough is too dry, add a splash or two of milk alternative, if it is still too sticky, add a little more flour. It should feel slightly sticky to the touch, but not actually stick to your hands as you knead. Transfer the dough to a large bowl, cover lightly with a lid, damp towel or plastic wrap, and let rise in a warm, draft-free spot for 1 hour. Grease and flour an 8x4-inch loaf pan. Punch the dough to get the air out (The fun part). Roll dough into a loaf shape to fit in your prepared pan, place it in the pan and cover lightly with a damp towel or plastic wrap, and let it rise for another 30 to 60 minutes, or until it is peaking out over the pan and looks like a loaf of bread. Preheat your oven to 350ºF. Bake the bread for 35 to 40 minutes or until the top is a nice golden brown. Let cool for 5 to 10 minutes in the loaf pan, before popping it out to cool completely on a wire rack. 100% Whole Wheat Sandwich Bread Option: Replace the bread flour with wheat or white-wheat flour, but start with ¼ cup less, adding more as needed. Add 2 to 3 tablespoons of vital wheat gluten with the flour. When using all whole wheat flour, adding gluten helps to keep the dough pliable and prevents a dense loaf. Hi Alisa, I’ve been looking at different bread recipes and was wondering what the difference between oil and butter or margarine in the bread may be… ? Hi Carey, aside from the obvious flavor differences, butter/margarine are lower in fat than oil (oil is straight fat, with 14g per tablespoon), while butter and margarine are diluted, with 11g) and introduce other ingredients in the case of margarine (water, stabilizers, etc.). I typically use oil in bread recipes for best results, but may use non-hydrogenated dairy-free margarine if specifically looking to impart that buttery flavor. Can you use all whole wheat flour instead of the bread flour? That will make the bread too dense. If you use all whole wheat flour, then you will want to add 2 tablespoons vital wheat gluten. Even with that, the loaf will be a touch more hearty and not as light in texture. We needed a dairy free bread recipe at camp to accomodate a friend. The first time we (my mom & I) made this recipe we knew we were in love. 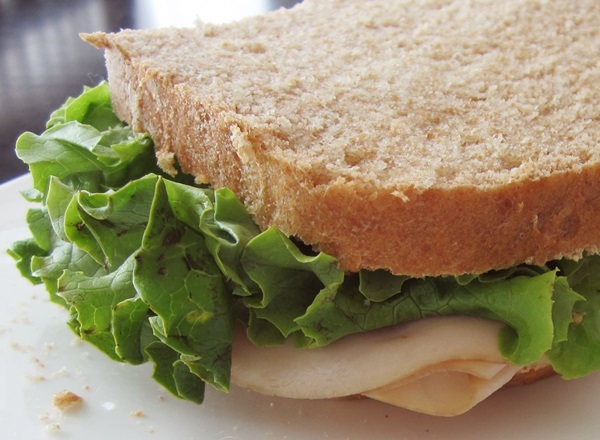 This is the perfect sliced sandwhich bread recipe. I will be baking it every week in place of the honey wheat and whole wheat breads purchased at the store. We have made it multiple times already, somtimes with soy milk, others with almond. As for the oil, we have used extra virgin olive oil and canola oil. It seems we cannot fail! That’s wonderful Toni! I’m glad you are all enjoying the recipe! Thanks, Alisa. I have tried it a few times in the breadmaker, and my loaf tends to get really big and really dark on the sides. I read that when converting recipes, I may have to reduce the amount of flour and/or yeast. Perhaps it’s rising too much! I will toy with it. But it tastes DELISH. Thanks for the recipe. Hi Kelly, I would change the crust setting to “light”. We always bake whole wheat bread on the light setting. If you like the texture of the bread, but want a smaller loaf, reduce the batch by 1/3 or a 1/2. If there are too many air pockets (it’s expanding too much), you could simply reduce the yeast by 1/4 teaspoon, and see how you like the results! It’s possible, but I haven’t tested it as of yet. Wow! Thank you so much for sharing! My entire family loves this bread…even my husband and he is the pickiest eater ever! I love the simplicity of it, so easy I made it while amidst fixing dinner so I could have some yummy sammiches for my kiddos school lunch! Not ramble, I’m just super excited! So glad you are loving our recipe Christie! My niece still makes some version of this bread every week – she never tires of it. Yes! I don’t think I’ll ever buy store bought bread again! This bread is super easy to make and tastes great. I didn’t have bread flour so I subbed white flour and it turned out awesome. So glad I made it. Glad you enjoyed our recipe! I don’t have grape seed oil… Can I sub canola or olive oil in its place? How would you make it gluten free? You can try a GF bread flour mix with gums. I’m still working on a gluten-free loaf, and haven’t perfected one yet. It would be a whole other recipe – conversions to gluten-free aren’t always that easy!